Reader Jora Thompson sent in the following this morning. I've been considering a Smudgeguard myself. When I first got my iPhone and later my first iPad, I was very fastidious about wiping down the screens daily. Now with five other touchscreens spread throughout the house, I'm lucky if I wipe them down once a week. Do you use a Smudgeguard or a similar product? Have you tried making your own like Jora did? Let us know below. Smudgeguard, the height of tablet pc artist fashion? I have used a Smudgeguard for years. I know a lot of illustrators don't use them. I wont go through the lengthy list of uses of a Smudgeguard for traditional and digital. but I will say for a traditional, or digital illustrator: completely worth it, and even more worth it if you work on a screen tablet. Especially important if you do pencil work, ink work, or digital inking. After 5 years, I just recently lost my Smudgeguard, sadly right before I got my Surface Pro. I did not want to wait for shipping, so I went to local store and bought a pair of $0.50 one size fits all winter gloves (thinnest also happened to be the cheapest). 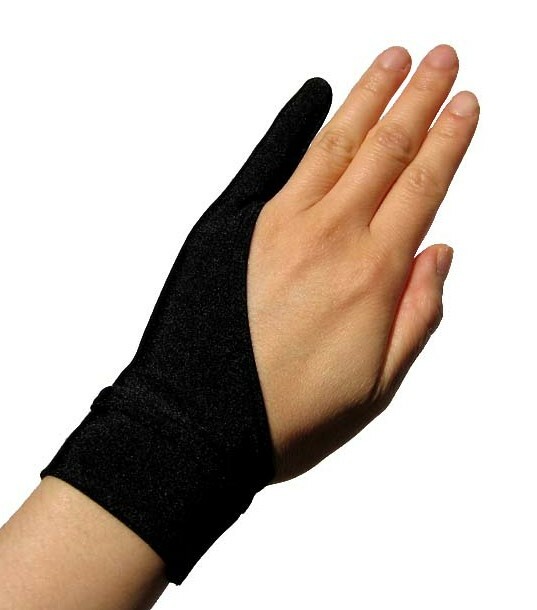 Cut them to resemble a Smudgeguard (leaving only pinky, side of palm, and wrist covered. And bingo! Now my hand effortlessly glides over the screen and will even after marathon sessions. ...and so rarely in life does this happen, and does it ever happen for $0.50? The temporary solution to my small problem, totally negated a much larger issue I was having...palm rejection. My pro is not defective, just the way I hold my hand/lift pen and set down hand is just out of bounds so that the palm rejection is not reliable. With the glove I don't worry about this at all. Ultimately I will still be seeking a different smudgeguard, since I don't expect this one to last for years, and isn't as perfectly comfortable or as thin as the other. I don't know if an 'official' smudgeguard is thick enough material to stop palm rejection. Also I think they are more expensive than they used to be, I'm sure a person could make their own. I imagine non-scratchy thin polyester gloves would be best to DYI. And I have heard a lot of people say to me, "I don't want to have to have this thing on my hand when I draw/paint"
I'm sure many inexperienced archers said the same thing in reference to drawing an arrow. Also, with the a specifically made Smudgeguard, you forget your wearing it after a moment, many times I've gone to the store... sat down to dinner... still wearing it.